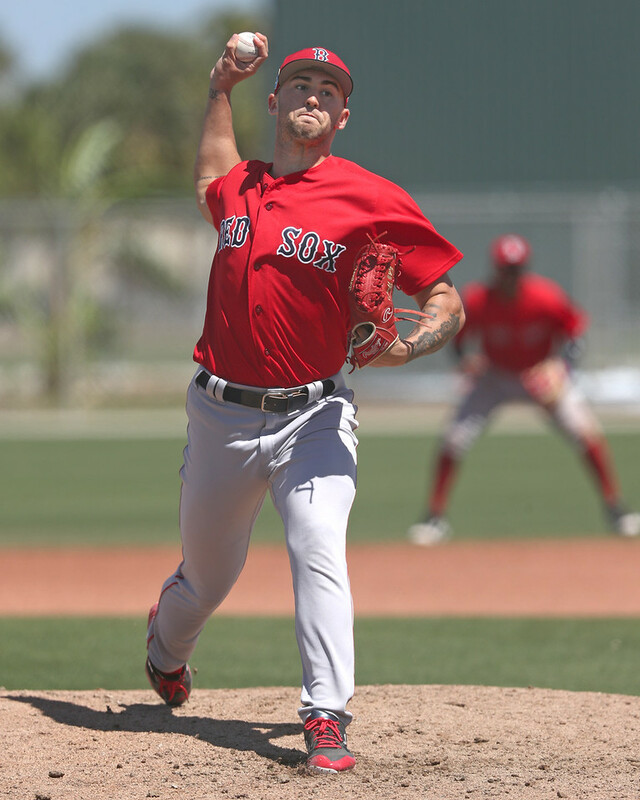 A few members of the SoxProspects.com staff wrapped up their trip to spring training last week. Thorough write-ups on the more notable players will be posted on the News page over the coming weeks, but the staff also shared some interesting nuggets on Twitter. Both Director of Scouting Ian Cundall and Assistant Director of Scouting Chaz Fiorino saw Alex Scherff (pictured), with Cundall noting his quick, live arm, while Fiorino observed that he was struggling with his release point which led to inconsistent results. Scherff posted on his Instagram page that he will be heading to Greenville, which is an aggressive placement for the 20-year-old fifth-round pick who is ranked ninth in the SoxProspects.com rankings. Executive Editor Chris Hatfield saw Tanner Houck, who showed the mechanical tweaks that he discussed in interviews over the offseason. Hatfield had Houck's fastball topping out at 97 with a good slider. Hatfield went on the Downtown with Rich Kimball podcast to discuss his trip to spring training, and he gave his thoughts on the current talent level in the system while also talking about some of the big names he saw. One of the more promising stories in big league camp this year was that Sam Travis was showing more power. The scouting backs that up, as Cundall noticed that the first baseman was driving the ball and had more loft on his swing in batting practice. After throwing 1 1/3 scoreless innings on Sunday against the Rays, Marcus Walden introduced himself to a lot of fans who may have never heard of the 29-year-old right-hander. His hometown paper, the Fresno Bee, covered his long journey to the major leagues and how his wife supported him through the 11-year endeavor. The Red Sox announced that they released outfielder Steve Selsky, who they had re-signed to a minor league deal back in February. Austin Maddox, who was likely slated to begin the year in the Pawtucket bullpen, was placed on the disabled list with a right shoulder strain. The injury has limited him all spring and he did not appear in any spring training games. Joining him on the disabled list is Marco Hernandez, who was placed on the 60-day disabled list as he recovers from left shoulder surgery. The Sea Dogs announced on Friday that they will join the growing number of stadiums in extending the protective netting to protect fans from foul balls.